Studies show that about a fifth of homebuyers were not prime borrowers. Discuss the repercussions of loose lending standards on the US economy. I personally believe that US Americans are unable to get prime rates because, uh, some people out there in our nation don’t have money, and, uh, I believe that our banks like such as in South Africa and, uh, the Iraq everywhere like, such as and I believe that they should, our lenders over here in the US should help the US, er, should help South Africa and should help the Iraq and the Asian countries, so we will be able to build up our future for our children. Apple's attempt to crack into the global cell phone industry will come with many hurdles. Sure its sleek design will attract some, but is it enough to capture global users? Cell technology in Asia is so far beyond that of the US. I especially like how you can buy stuff with your phone... the iPhone should develop a partnership with credit card companies to have a function like Mobile's Speedpass. And then add GSP functions... then Apple's iPhone may compete with markets in Asia. Otherwise... I'm not sure the sleek design will be enough. 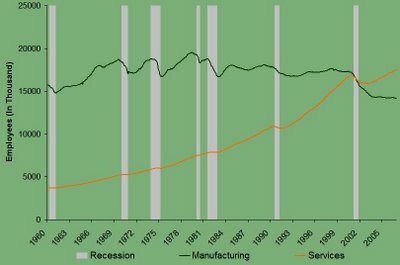 Before regulators decide to take some protectionist policies to "protect" US manufacturing jobs, they should take a good look at the transition of the US employment. 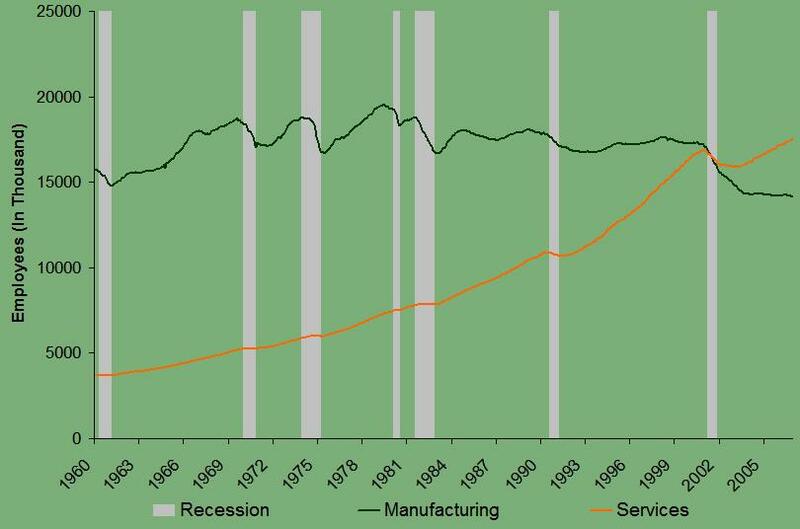 Here's a chart that illustrates how "Professional and Business Services" jobs have outnumbered "Manufacturing" jobs. The switch occurred right after the most recent recession, and I would imagine the gap to only grow wider over time. 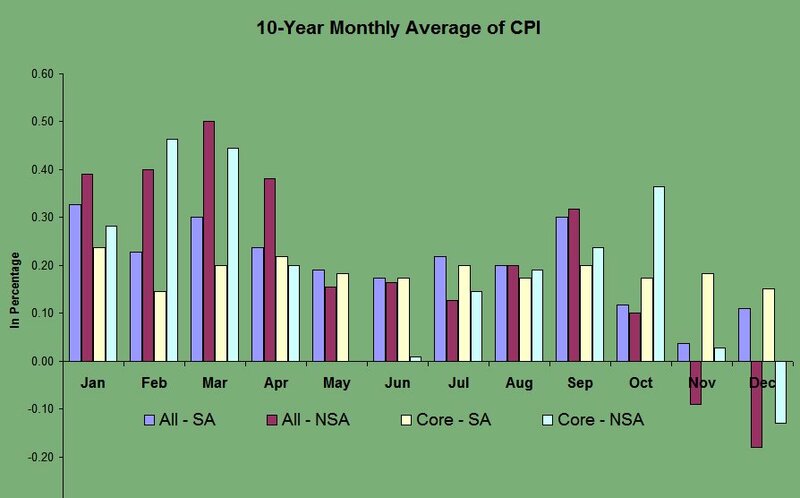 Here is the 10-yr monthly averages of the CPI data. 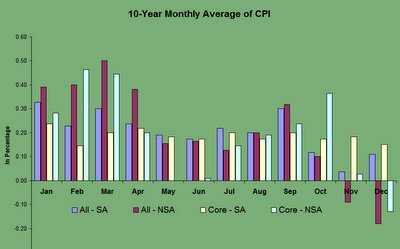 Whether or not you have any faith in government statistics, you can see that inflation has been rather tame in the months of November and December. The recent CPI release for November should've been no surprise as we've been hearing about discounts, discounts, discounts. Retailers are just trying to unload inventories before the yearend. The Once Almighty Dollar has been falling against major currencies. Why, you ask? Well, where do we start... Trade deficit numbers in terms of GDP suggest that we've been consuming foreign goods well beyond sustainable levels. And why shouldn't we? Especially if someone is selling us goods cheaper than how much it would cost us to produce those goods and services. Oh, that's right... that whole comparative advantage thing and free trade have offered cheap stuff. But things have been starting to change. Our greed fueled us to buy more and more, and we didn’t care about running up our credit bill. And our good friends Japan, China and the UK have been more than gracious in providing that credit by buying up Treasuries. Why not, our rates were relatively higher than what was offered elsewhere. This excess flood of capital allowed many of us to buy homes that we couldn’t afford. In turn, we bought and bought because we could use homes to get even more credit. That’s awesome; only here, can we get credit upon credit. Now that we’ve bloated ourselves, we now have to settle our bill. Given the not-so-grand outlook of the US economic health, our rates have fallen (you know… because the Fed would have to cut rates in case of a falling economy) below that of other nations like Australia and the UK. Furthermore, Japanese rates may go up, which would leave less room for carry-trade opportunities, especially with the lower US rates. So basically, nobody really wants to buy US assets (not to mention Paulson’s case about the restrictive Sarbanes-Oxley). Au contraire, export-led countries like S. Korea would want the US Dollar to remain strong. That’s probably why their central bank has been trying to support the dollar. Then on the other corner, you have the Chinese, who also depend on exports to the US, who haven’t done much except indicate that they will start diversifying away from the US Dollar. Well… they’re in a predicament as well, given that they have much invested in the US Dollar and the protectionist-loving US democrats have taken over the house. Given the conditions, most will take tip-toe movements. Either case, imported inflation looks like they will go up for US consumers... but then again, there is a Federal Reserve research paper that suggests real imports into the US haven't been significantly influenced by exchange rate movements. But that was "real" figures which get adjusted for inflation. That just tells me US consumers have been buying and buying despite higher prices of imports. No inflation… right… tell that to the economists who look ahead (and I didn’t even talk about the tight employment conditions). I don’t think Microsoft’s Vista will save the day with productivity improvements, but we'll see. Mr. Bernanke has a tough job ahead. Slower economy… higher inflation… hmmm… what’s a guy to do? My guess is nothing! There's a lot on my mind right now... like my girlfriend pushing for that engagement ring... you know the story. I'm thinking maybe I should take her to see that Blood Diamond movie and show her the sad economics of how things work. We don't live in a perfect world, and that's how many profit... oh well. I'm not gonna cry about it. Then again, I don't applaud exploitation. That's really not my point. Pretty things are all over the place; I just view useful facts as something beautiful. The thing is... information is all over the place and everyone interprets them differently. Not even the "Blue-Chip" economist can agree on how to interpret recent economic data. One will tell you this while someone else will tell you the other. You know what that tells me... Go figure it out on your own! Here's one of our recent newsletters... enjoy. I haven't posted in awhile, and that's because I've made a transition into commercial real estate. I've been learning that the commercial real estate industry is a whole different monster on its own. It's a great experience for me since real estate (not single-home) continues to thrive as a viable investment vehicle. Even hedge funds are coming into the industry to play their strategies. It's definitely a fun time as I continue to build my investment knowledge foundation. Financial Sense Online - Newshour's Ask the Expert - interviewed our principal, Tom Au. This one hour audio interview could be obtained through this link. The interview discusses some of the topics in Tom's book, "A Modern Approach to Graham & Dodd Investing." Many people dream of their retirement days. We hope that when that day comes, we can crack open that nice nest egg and have sufficient income stream to live comfortably. Perhaps take several vacation cruises here and there. To realize this dream, every worker plans his or her personal finances accordingly. Sure it sounds simple enough; however, the behind-the-scenes involved with retirement plans resemble something more like rocket science, especially for the plan sponsors and the professionals that serve such plans. The rest of my January report for RW Wentworth can be obtained at the following link. The report goes over the controversial accounting method for pension costs to companies and covers the current situation that surrounds the problems with defined benefit plans. Paris Hilton describes a trendy item or a passing fad by claiming “that’s hot.” Perhaps that’s how she’d depict some real estate markets in the U.S. Lately there have been some contradicting views about the current state of our economy. Some maintain that the economy remains strong and real estate price levels do not merit concern. On the other hand, some argue that certain pressures will eventually crack the adamant economy. Well, exactly how hot is the U.S economy? GDP figures suggest that our economy has been continuing to grow at a healthy pace despite some of the negative exogenous factors (i.e. Hurricane Katrina, etc.). However a rapidly growing economy usually comes with inflationary pressures, and in turn with rising interest rates. It's going to take more than a cosmetic makeover to turn around Sears/Kmart. I would guess that people shop at WalMart because shoppers know they will find cheaply priced products. I'm not sure how much power Sears has over its suppliers, but as many already know, WalMart dominates many of its suppliers. WMT also has unique, yet sometimes controversial, employee policies. WalMart has also been on top of the supply-chain logistics with things like the hub and spoke distribution network. WMT's control over the costs is what I'd imagine allowed the company to offer cheaper products and establish its current position. I'm not sure how Sears/Kmart's model works, so perhaps it's problem is more than what I've suggested. It's kinda tough being a value investor in a strong market. Traditional "value" methods of screening for companies will rarely pick out winners in current markets. And if you look at it relatively, SHLD looks more of value play than stocks like WMT. SHLD's enterprise value is almost $22 billion. It's current assets amount to about $14 billion, so if you liquidated all of its assets (including PP&E and excluding intangibles), you'd probably have about $25 billion. Now consider WMT, which has an enterprise value of almost $240 billion. Yet it only has about $40 billion in current assets. And if you fully liquidated all of its assets, you'd probably end up with half that of its market value.Value investing is great and all, but it's so hard finding candidates that meet all the criteria. I guess it really depends on how you define "value." Besides looking at their assets, you'd also have to consider their liabilities and obligations. And compared to many other stocks out there, SHLD looks like a pretty decent value play. SHLD just needs to make sure it can get rid of their inventory, enough to meet its current liabilities. But it’ll take more than that to compete profitably in the long term. When Mr. Buffett is buying companies like WalMart and Anheuser Busch, you'd really have to wonder how he's measuring value or intrinsic value. I guess he really does weigh ROE greatly into his valuation matrix. But I would've never guessed that he'd go for WalMart at these levels... he's probably using some revenue ratio to value that play. I remember driving past some retail stores three weeks ago, and I had noticed that they were putting up the Christmas decorations. I thought to myself that it seemed somewhat early to be pushing Christmas. The currently uncertain economic outlook must have led the retailers to act anxious and nervous about the upcoming holiday sales, on which many depend. Naturally, I thought it would be wise to visit some well-known malls in LA over the weekend to see how shoppers have responded to the early Christmas promotions. Not to my surprise, I didn't see that many shoppers - not even the expected mallrats. So what does this mean? Well, people could be putting off their shopping for Black Friday or last minute shopping. Perhaps many have planned to avoid the hassles by shopping online. Or maybe it's the retailers fears coming true. A bleak Christmas would mean some difficult times up ahead. People should check under the Christmas tree for the number of presents, which could be called the Santa Claus indicator. If you see less presents, then maybe we're in for a slowdown. If there are plenty of presents, then I suppose we shouldn't worry too much. Dealing with China has been less than smooth. First it's currency "manipulation" and lack of intellectual property protection, which have led US authorities looking to take some form of action - whether through its own countering actions via tariffs or through pressuring the WTO to take actions. Now there's something else going on in China. It envolves a huge short copper position (in the hundreds of tonnes) by a trader named Liu Qibing, exept it's unknown wherther this individual actually exists or not. I'm not going to speculate here, but things smell rather fishy. Here's a link to a story on Asia Times Online that gives some possible explanations to this mystery phantom trader. Convincing a non-blogger to read blogs is like trying to persuade an oven user to use a microwave. Why should a person use one’s time reading blogs, when that time could be spent reading the traditional newspaper? Many people do not like changes, and those who tend to make slow adjustments usually get left behind. Blogs offer readers various viewpoints of a particular topic, taking away some of the influence of the traditional media views toward certain subjects. How well the blogger convinces one’s readers will depend on the credibility of the information presented in his or her posts. In traditional method of presenting information, the reporters’ or analysts’ works must be approved by the supervisor, who is careful (in most cases) to avoid any potential litigation dangers. I say “in most cases” because of the CIA leak story (which placed CIA operatives’ identity in jeopardy) by Judith Miller that was approved by the New York Times. Risking people’s lives to sell a story is beyond me. When I prepare financial and economic reports for formal purposes, those analyses needs to be approved by my supervisors. However when I do research, I find it useful to read various resources which include blogs as well as traditional and formal sources. I’ve learned that some blogs contain unreliable data, but I’ve also found that others have valuable contributions to the information that I seek. This method gives me a wide perspective of the subject, which allows me to make my own careful conclusions. Blogging represents a good medium to offer a quick thought on a subject or even hold forum-like discussions. If bloggers abuse their sites to express their nonsense, then that will be their demise. Others that offer useful insights will contribute to the sustainability of the blogging trend. I doubt that the traditional newspaper media will go away. The way I see it, we will still cook our turkeys in the traditional oven. Sure you can reheat the cooked turkey in the microwave, but I would hate to taste the turkey that was initially nuked in the microwave oven. Additionally, as people have learned not to use metallic items in microwaves, I hope bloggers will learn not to use BS and nonsense in their blogs. In the 90’s we saw a bubble in tech. Inflationary concerns have led to the Fed increasing fed funds rate, perhaps a bit too much. Imbalances have caused some to be very concerned, while others touted that tech will change everything and that their valuations should reflect this outlook. Smart money got out as many suffered the effects of a bubble popping. The slowdown in the economy had led the Fed to start lowering the fed funds rate in order to pump some confidence in the markets. Instead of going into a major recession, the money had shifted to real estate as these assets currently remain extremely inflated in certain hot markets. What have people learned from these experiences? The real estate market isn’t liquid as stocks, but we’ve seen that real estate is more liquid than many have thought. Property flippers have come into the market like traders and contributed to the rising artificial price of properties. I’ve seen many people jump into this home purchasing bandwagon (mainly fueled by cheap credit). One of the problems we saw during the rise of the tech bubble was the use of leverage in the form of margin purchases. As the stock market headed southward, many began to receive margin calls, which may have accelerated the bubble burst. I can’t help but notice the similarities between these two leveraged purchasing patterns. In both circumstances, many have used borrowed money to chase these rising assets – in many cases without fully understanding the risks they have bore. In some cases, those who have learned from the stock bubble have realized their profits from their real estate plays and have been laughing all the way to their banks. However, there still are others who are in a potentially serious problem. These people are those who have bought their properties during the peak using interest-only financing. When I ask some of these people why they would do such a thing, they tell me it’s because they couldn’t afford a fixed financing, and that it’s ok since they plan on selling the property in a couple of years. They have bought into the idea that these prices will keep going up, just as those who thought the stock market will rise infinitely. Once again, we have “irrational exuberance,” but this time in the real estate market. Relative to the real estate market, stocks look cheap. However, the US economy remains uncertain. Our principal at RW Wentworth, Tom Au, believes a lackluster future waits in the next coming quarters for our economy. You can read a brief highlight of his interview with The Wall Street Transcript (TWST). Where will the money flow next? Perhaps towards some value stock plays or maybe even toward international markets. Faire Isaac (NYSE: FIC) has hired a key employee to lead its efforts in Japan. FIC provides analytic and decision management technology to its clients. The Company uses advanced algorithms and programs to gauge risk levels of customers, which allows Faire Isaac clients to make intelligent decisions. This is exactly what Japan needs. The country has been plagued with problems in the financial institution. Non-performing loans remain relatively high and threaten the health of the Japanese financial system. Japan will need to move away from their past lending policies that are heavily influenced by personal relationships. Utilizing analytic technologies will allow these financial institutions to better understand their customers and the associated risk levels. The Japanese economy has been in the dumps over the past years, but it appears that real reforms are in the works. Their deflationary trends seem to be reversing, but Japan will need to clean house before things look clear. US Treasury yields have jumped today. According to Bloomberg, approximately 50% of Treasuries are held by foreign holders. It appears that there is a slight stall in Treasury purchases, which would explain this jump on the yields. We will need to keep an eye on the countries that hold large shares of Treasuries such as Japan, China, South Korea and oil producing countries. On the homefront, we are currently going through a transition period as many observe the various forces that will steer not just the US economy but the global economy as well. Many wonder how well Mr. Greenspan will pass the baton over to Mr. Bernanke. This transition should be relatively smooth, but will the new Chairman push towards a formal “inflation targeting” policy? Will there be a closer tie between the Treasury and the Federal Reserve? Only time will tell. When people think about international investing, they cannot ignore China. The country represents a huge market, but some of its structures still remain questionable. Some major reforms are needed before people begin to trust their money in a socialist run economy. Today's post on Asia Business Intelligence, contributed by Mr. Howard H. Jiang, explains in detail the financial structure in China. Mr. Jiang thoroughly outlines the steps for foreign financial firms to enter this potentially profitable yet risky market. I highly recommend reading this piece if you consider doing business in China. Steve Jobs wasn't kidding when he said that Apple will create markets by teaching people how to use their iPods. I love catching companies work themselves into movies or TV shows. The best are the quick subliminal type of screenshots. But going back to Apple, they seemed to have made some deals with TV show producers. I was channel surfing and saw that Apple’s iPod had made its way into some scripts. On the new show E Rings, there were a couple of marines trapped in a small building. I believe they were surrounded by enemies and were in desperation for rescue, but they had no obvious means of communication. Wait… good thing one of them had an iPod. They were able to rig the gadget and somehow connect it to a telephone wire or something. They then applied the podcast application to transmit Morse code. To those that haven’t familiarized themselves with podcasting, it’s a method of publishing audio and video signals over the Internet. Think of it as the audio and video versions of blogs. It’s undeniable that we’ve entered a new era, and new markets will continue to be created. The digital world has been changing our society. I’ve heard that newspaper companies have been hurting during this transition. Internet sources such as Yahoo or even blogs can be blamed for the hurting newspaper industry. With the rising trend and popularity of podcasting and portable digital devices like the iPod, will radio and TV suffer a similar pain that newspapers currently feel? Do They Really Have a Case Against Violent Video Games? I'm not much of a fan of Michael Moore. I find his bombarding interview tactics very rude and his manipulative editting methods very deceiving. It's funny how he accuses large corporations and greed for the problems in our society. Yet he uses his tactics to sell his story and make tons of money. But I'm not writing now to point out his hypocritical point of view. Instead, I agree with one of his points in his "Bowling for Columbine." Media is quick to blame so many things on gun violence in our society. We have become so accustomed to play the blame game, and we see this everywhere. People probably fear taking on responsibilities anymore. I used to think taking blame for others was honorable... not anymore. It's flat out stupid to do so in our society. Especially while we continue to play this blame game. I found one interesting point Michael Moore pointed out, and that was about the effects of video games on gun related deaths. I found it funny how Japan creates and plays most of these "violent" games, yet the country only sees 39 gun related deaths per year, according to Moore's data. This is opposed to over 11,000 gun related deaths yearly in the U.S.
Parents need to take some responsibilities and stop playing this blame game. Let these kids play their video games... if anything, it probably keeps them away from real-life problems. I don't really condone video games, but I know video games aren't to blame for the real-life violence. Kids will fulfill their appetites one way or another. If we take away violent video games, then we need to eliminate movies, news, history, etc. Come on, this is not realistic, and we will never live in a perfect society. Stop blaming others for your misguided mistakes that come from the lack of fufilling your own responsibilities. In this time of globalization, international investing has become a familiar term. But where do you invest? I'm not going to lie and say that it's an easy task. Perhaps it's best that you consult your investment advisor if you plan to diversify globally. Or maybe you prefer managing your own money and taking your own risks. You could invest in country indexed exchange traded funds. But where do you start? That depends on your risk tolerance level and how much you value safety. For starters, you may want to look at the Corruption Perceptions Index, which is an index of surveys and studies conducted by Transparency International of Berlin, Germany. 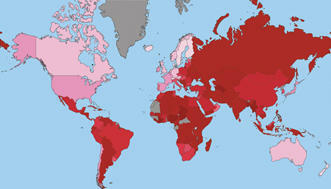 This CPI ranks countries according to corruption levels (1 to 10 with 10 being least corrupt). The following diagram is one of several sources issued by the organization. U.S. Treasury Secretary had positive comments on China's reform after meeting with China's leaders this weekend. He talked about how "real" this reform seems. Mr. Snow probably came out and positively spoke about this because Good Ol' Mr. Chuck Schumer is probably barking about China's slow progress to revalue the yuan. Schumer had previously promoted his Schumer-Graham bill, which would raise tariffs on Chinese imports by 27.5%!!! The senators are, for lack of a better word, pissed at China. Obviously Snow and Greenspan oppose this bill because if this bill passed, Wal-Mart shoppers will suffer, inflation would immediately rise, and China who has been a big buyer of Treasuries will retaliate. I wrote about Schumer's bill several months ago for RW Wentworth. There's alot more to this story than Snow just coming out to say that this reform is happening. Another problem that congress finds upsetting is the lack of intellectual property laws in China. There's really too much going on for me to comment here. You can read my article on the following link. Refco has made some negative headlines lately, and its public listings status remains in jeopardy. Many corporate frauds have come out in the recent years and in various forms. My best guess is that Refco's thing is probably more like that of the Barings Brothers back in the mid 90s. I'm not sure, but Phil Bennett seems to have pulled a Nick Leeson who fraudulently hid huge losses when he made some poor speculation after another. We all make mistakes, but Leeson and Bennett pulled some incredibly ballsy blunders. Some of you may know what happened to Barings Brothers. It closed its doors, and ING bought it out. I heard ING got rid of the Barings name and assets earlier this year. Perhaps Refco will face a similar fate. What has bunch of letters and over $3 TRILLION? Give up?... it's Japan's Postal Savings System, which was state-owned until now. The bill to privatize the PSS finally passed Friday (today) by a vote of 134 to 100. This has been a long fought battle for Japan's Prime Minister Junichiro Koizumi, but he did it. The privatization process will commence in 2007 and expected to be completed by 2017. We at RW Wentworth have been following this long-awaited battle and believe this will have some implications to certain U.S. assets. My report on this matter should be freely available on RWW's website in the coming weeks. Many conservative and mature individuals may view video games as an occasional stress reliever. However, many gaming participants under their mid 30’s consider interactive games as a major part of life. In this regard, this phenomenon is comparable to that of rock music to the baby boomers. Instead of Led Zeppelin or the Eagles, the makers of Halo, Grand Theft Auto, and the likes have cultivated loyal fans lining up to purchase the next sequels and hits. Video gaming has impacted our culture. My observations and also those of others show that gaming participants (gamers) range widely in age and game purchasing patterns. Apparently, games have changed exponentially since the 1950’s when Ralph Baer had the idea that games could be played on TV. Only few would have seen what was about to be created decades after playing Pong and Atari for the first time. Generation X and those following have been witnessing the transition in the video gaming industry. Industry participants have come and gone. Some familiar names such as Nintendo have survived by adapting to changing technologies and demographics. Conglomerates like Sony, Vivendi Universal and Microsoft have entered the playing field and possess great influence in changing environments. While some company divisions focus primarily on game consoles, other companies such as Electronic Arts have sustained loyal gamers for their popular gaming programs. We have seen large conglomerates enter the market as others have built their companies supported by the growing video gaming popularity. I do not condone allotting time spent on video games to pass the time, however we cannot ignore that the gaming phenomenon has evolved into a healthy industry. Not every company involved in the industry will capitalize from growing industry sales trend. On the flip side, those that develop and apply viable business models with steady revenues will thrive from rising numbers of gamers and sales. Many now realize that, like the radio and television, the Internet is simply a medium that we use on a daily basis. So, where do video games fit in the picture? Perhaps a brief historic overview will give us a hint of where interactive gaming is headed. As our Executive Vice President Tom Au mentions in his book A Modern Approach to Graham & Dodd Investing, the Internet could be viewed as the radio during the Roaring Twenties. The number of radio broadcasting stations increased from 3 in 1920 to 500 in just four years. In the fifties and sixties, television became the new means of communication. During both of these eras, “experts” pronounced to listeners and viewers new and efficient ways of conducting business. These overly optimistic views spread through the public and fueled investor confidence in the stock markets. One cannot ignore the similarities of these two eras and the recent Internet era. Of course, we all know that dismal economic periods followed these booming eras. Keep in mind what was going on with the music industry during the seventies. Rock & Roll began to have sub-genres, and rock music became a big business. One could make an argument that people in the 1970’s turned to music to escape reality (period of "stagflation” and oil shocks), just as some people currently do when they engage in virtual interactive reality. Perhaps the video gaming industry will experience a similar success that rock music had during the seventies. The Internet represents a new playground for gamers and allows industry participants to profit by adjusting business models. Interactive gaming has gone beyond the console and cartridge or CD model. Industry participants have become creative in distributing their games to the consumer and generating additional and recurring revenue. Previously, these interactive software producers were vulnerable to piracy and illegal downloading. Stolen intellectual property remains a large problem for many policymakers and business decision makers. It’s not just video games, but all software-related products and that of other entertainment industry participants. Protecting innovators and patent-holders is key to sustaining a productive future. Who in the right mind would be willing to expense the hefty R&D costs (estimated to have topped $10 million to develop a new hit game), if these producers figure that their end product will be stolen and sold by those who exploit piracy practices? This problem has been affecting many companies, particularly those in the entertainment and software industries. Some companies have addressed this problem through various methods. Some independent gaming producers have turned to offering free downloads. This represents a step towards making these vendors who copy intellectual property obsolete. However, the intellectual property holder needs to generate revenue through other means besides from the end-product sale to the consumer. Some game makers share profits from host sites that generate revenue from advertisements. As we have seen after the Internet bust, the advertisement-only model does not generate sufficient revenue stream for companies to sustain positive profits (excluding Google). However, there may be some light for those who have applied the subscription-based model. Some gaming industry participants charge retail prices of $20 to $50 for their software. Additionally, some have been successful in building loyal gamers who willingly pay a subscription to participate online. Popular PC games charge approximately $15 per month or $45 per quarter. Microsoft also offers a subscription service for its Xbox console and charges $5.99 per month or $49.99 annually. Subscription-based models may point to the answer to piracy that has been plaguing the entertainment and software industries. Companies who become successful on implementing this subscription or lease-like strategy will benefit from the growing number of Internet users and broadband connections. Of course this also depends on how well these companies monitor rogue gamers and gather subscription-paying gamers. Organizations have arranged tournaments with attractive prizes for winners to increase popularity of selected games. Gaming continues to evolve as serious gamers make a living as professional gamers. The video gaming world has come a long way, just as baseball has evolved since the Knickerbocker days (the time when first published rules of modern day baseball were documented in 1845). -AIM is favored by younger users, but its popularity seems to be on the decline. -MSN has found itself useful in the corporate world. I know for a fact that employees working for large conglomerates, who need to communicate with their counterparts in foreign countries, fully utilize MSN's instant messenger. This is a huge cost savings method for those who conduct business outside the country... think about those in the U.S. who need to communicate with the manufacturing department (most of which have gone overseas). Now think about what the phone bill would cost without instant messengers. Here's probably what's going on... make corporate users rely on MSN IM product so they can support Microsoft's continued dominance/monopoly. If you think about it, MSN's instant messenger is not really free... you'll pay for it one way or another. -Yahoo's messenger seems to be slowly taking away MSN's users. Which leads me to believe why MSN wants to do this deal with Yahoo. They probably also realized that Trillian poses a threat. Apple’s new iPod will offer video capabilities, and Apple and Disney have shook hands to deliver “Desperate House Wives” and “Lost” to the new iPod. Steve Jobs mentioned that there currently is not a market for portable video devices, and that Apple will need to create one. They also cover their claims by reassuring people that their main function still focuses on mp3s. I don't know about you, but I remember those tiny portable television devices in the 80's; but the only place I saw them were at baseball games, where fans would bring them to anxiously see if they might be caught on TV for a slight second. Yeah... that fad died out quicker then SUV's popularity in current gas price trends. Going back to portable video players, Apple isn't the first to do this. There are Samsung's Yepp players, among others, that already exist in the market. I've noticed that kids favor this product, but they get this product mainly for bragging rights or bordom remedy. I'm sure there will be other uses for portable video functions, but I guess Apple will have to create this market... time will tell. NHL has commenced its season after a year-long absence that was caused by contract disputes between the players and owners. This was something that the league did not need, given the lack of ice hockey’s popularity among U.S. fans. It’s a well-known fact that ice hockey is the dominant sport in colder regions such as Canada and Russia. However, many Americans would love hockey if they learned the true essence of hockey. Hockey is not a boxing match on ice. Instead, it’s a finesse game played at high speeds. TV viewers have complained about the difficulty of following the small puck on their TV sets. HDTV will be the answer to that problem. I am very familiar with television technology because I grew up being a child of a Samsung engineer. I will tell you that people will be able to follow the game much easier because of the clear and high resolution pictures produced by HDTV sets. The kid in me will always love playing ice hockey; but when I think of sports nowadays, I am beginning to see more of the business aspects of the sports industry. Of the four major sports in the U.S., NHL will probably most benefit from dropping HDTV prices (particularly those that use DLP technology - a Texas Instrument proprietary product). NHL must resolve many issues to regain momentum. On the bright side, the league started the long awaited season opener with a bang, nearly selling out across the arenas and with a record attendee level. 1. There is in actual fact almost inexhaustible supply of commodity X. 2. Increased demand causes temporary dearth of supply. 3. Then people, especially pundits paid to sell papers, holler that the supply of X is running out. 5. Ever greater quantities of X are thus procured. 6. Price of X falls as supply outstrips demand, and then stabilizes. Several years ago, many energy players faced difficulties after the Enron scandal. Enron disrupted the whole energy industry, and many industry participants scrambled to refinance their debt loads. While some banks provided refinancing to some companies, creditors made a disciplinary example out of Mirant. The once well-respected company was refused the refinancing and forced into Chapter 11 (reorganization) bankruptcy. The company has been undergoing a lengthy court procedure to come to an agreement. Mirant has announced the positive momentum towards its exit from bankruptcy. The company has much milestone to accomplish, but the game is not over. I will continue to gauge Mirant’s progress during this critical and delicate phase. This type of play is not for the faint of heart and not recommended for those who do not conduct their own thorough due diligence. Sam Park owns OTC pinksheet common shares of Mirant. My recent newsletter for RW Wentworth is up on RWW's website. The report on the website is an abbreviated version that discusses some forecasting techniques. The full version can be obtained by contacting RWW. The Motley Fool’s Jeff Hwang wrote an interesting take on Overstock.com and its profitability. He points out that if Overstock ceases to spend on advertisements, then the company will be profitable. He assumes that by cutting on advertisements, OSTK will continue to grow at a zero percent rate. There are some things to consider. He also assumes that the past customers will continue to return to overstock.com and spend the same amount. There are a lot of “ifs” to Hwang’s version of “worst-case scenario”. The real worst-case scenario would be OSTK ceases to advertise, customers do not return, and OSTK’s revenue falls. I personally do not wish the worst for OSTK. I’m simply pointing out the immense hurdles that the company must overcome to survive. I don’t think it’s wise or realistic to completely stop spending on advertisements. Perhaps a change of its marketing to that of something more effective would be in OSTK’s best interests. Several people have questioned about the possibility of an inverted yield curve in the near future. Before I explain anything, I would like to note that Mr. Greenspan expressed his belief that the yield curve (this time around) does not necessarily signal a dismal economic outlook. As I have previously pointed out in my RW Wentworth newsletters, foreign entities purchasing longer term Treasuries may explain Greenspan’s conundrum. Many, including myself, explained that Asian institutions have spent their excess dollar holding by buying U.S. Treasuries. Excess demand for existing Treasuries (i.e. 10 year) will raise prices, thus driving their yields down. So is there someone else that may be buying these Treasuries to further drive the rates down and invert the yield curve? In light of these rising crude oil prices and speaking with other analysts, I believe that there may be new Treasury buyers. My previous post with the diagram of the gas price breakdown indicates that over 40% of the price we pay gas stations goes to crude oil producers. Since Katrina, we have seen gas prices jump all throughout the U.S. This would mean that more money goes to the crude oil producers for the same amount of oil. If these “petrodollars” get funneled back into the U.S. in the form of Treasury purchases, then we could see the longer term Treasury yields remain in their already low levels. If oil prices continue to rise, and if these petrodollars make their way into our system, we may even see long term yield fall below the shorter term yields (i.e. 2 year). The shorter term yields will most likely be impacted by the Fed’s decisions on the fed fund rates. As I have mentioned in my previous posts, the fed fund futures now indicate that the Federal Reserve is less likely to make many more hikes by the year's end. We are in no doubt dealing with a delicate situation. To answer whether the yield curve could invert by the year end… I think it’s a definite possibility, but a flat or humped curve is more likely. However, I wouldn’t be surprised to see a slight inversion before the year comes to an end. Keep in mind that a yield curve doesn’t necessarily indicate a recession up ahead. We saw a flat yield curve before Katrina made her devastating path through our country. However, it appears that she came with her hammer and nails, not to help rebuild, but to shut the coffin. Let’s just hope it won’t be too bad… perhaps David Blaine, the street magician, could explain how he survived for a week buried alive in his temporary coffin. Gas prices for regular unleaded in San Diego has surpassed the $3 mark. Even though California does not get its oil from the Gulf area, Californians will share the pain. I suppose the Big Oil companies will spread its costs all throughout the US. Transporting goods continue to remain costly, and those costs will likely pass through to the consumer. Inflation is knocking on the door. I'm not sure how much impact Katrina will have on our economy, but it will definitely slow our economy. Here's a doomsday prediction that I wouldn't like to see. If our economy halts its growth and prices continue to rise, we may enter stagflationary conditions. Greenspan has some tough decisions ahead. September fed fund rate prices jumped to 96.43 suggesting now that a September hike is less than 80%. Whether or not the Fed decides to raise rates in September, making moves (in either direction) beyond that may harm the economy. It's truly a sad sight seeing how people will loot damaged stores. I remember being in New York after the 9-11 attack... people came together and supported one another. That was completely different from what seems to be going on in Louisiana right now. Man, that is one disappointing and pathetic sight as cameras catch these looters who show no simpathy for their fellow citizens. Security can't even do anything despite being heavily armed. In my opinion, some of those nonlethal apparatuses would be perfect for dealing with such looters that give no respect for authority. In hindsight of Katrina, the September fed fund futures rose slightly to 96.40. It still suggests that the Fed will likely raise rates to 3.75% in September 20th meeting, however the likelyhood of 50 bps has fallen. I doubt an aggressive move is necessary. However, those disturbing gas prices will likely impact inflation and thus, our economy. Here’s an interesting story from the Washington Post titled Xtreme Defense for both venture capitalists and the kid in all of us who wanted cool James Bond gadgets. Just imagine how these tools would be able to get us out of sticky situations. There have been much talk and issues about the use of “nonlethal” weapons. This particular article follows around this entrepreneur with some interesting nonlethal apparatuses; but he learns that the venture capital game remains a tough game to play. This article points out some of the new technologies surrounding nonlethal weaponry and their possible applications. Some of these uses range from counterterrorism to controlling public disorders. The report mentions some other defense and protective related products. I particularly like the mini-fortress shelter that could double as a sauna. This product may have come in handy for this hurricane season. I don't like to think about capitalizing off disasters, but you know there are people out there who will take advantage of any situation. I say it's better to acknowledge the truth instead of either ignoring or condemning it. With that said, here’s a thought for the day. Money managers and analysts have a certain preferred method of building a portfolio. Generally speaking, most apply the top – down or bottom – up approach. Top – down basically means that you analyze the macroeconomic conditions and work yourself down to the company specifics. Bottom – up approach is the opposite, where you would screen for good companies and add them when conditions look favorable. Well, here’s a bit of a top – down thought for the day. Hurricane Katrina devastated the southern part of the U.S. And many victims currently suffer a nightmare-like pain that will not be easy to relieve. From an investment perspective, think about what companies will benefit from the rebuilding phase. People will pick up the pieces and move on with their lives. I guess God will have his say in influencing our economy. Hurricane Katrina is expected to cause a record high cost of impact. I don't know how the insurance companies have been able to survive this hurricane season... Let me rephrase that, I don't know how home insurance buyers can afford high premiums, especially with mortgage payments and these oil prices. Oil rigs will also be damaged due to such devastating phenominon. These overwhelming storms may be the catalyst that slows our economy. Oil prices will likely spike AGAIN as supply is decreased. Help! President Bush, I think we will need to see some of those strategic oil reserves. I'm afraid to drive anymore, because going to the gas station is like a glutton for punishment... but I don't know how much more I can take. You kinda have to ask yourself what's causing these storm attacks. I'm no scientist, but I'm thinking the reversal of the magnetic poles may have something to do with all of this. It's important to look through the past SEC filings to comprehend a company's outlook. You should also look at the economic factors that impact the company's revenues and profits. Another thing to do is to compare findings and valuations to its competitors. These tasks can be daunting, however looking through the 10 Q's and K's can lead to some warning signs that may prohibit further investigation and analysis. For instance, the Management Discussion and Analysis (MD&A) section explains the board's views of its company. You can also find off-balance sheet items that isn't reflected on its financials. I know my previous "blog" analysis on overstock.com is rather elementary, but a simple 30 minutes of analysis can reveal alot about a company. What happens after the 12th month? This statement is too vague. Maybe they're basing this number on the working cap burn rate, in which case... what happens after the 15th month? Just a thought. We may be unable to generate sufficient cash flow to satisfy our debt service obligations. Our ability to generate cash flow from operations to make interest payments on our debt obligations will depend on our future performance, which will be affected by a range of economic, competitive and business factors. We cannot control many of these factors, including general economic conditions and the health of the internet retail industry. If our operations do not generate sufficient cash flow from operations to satisfy our debt service obligations, we may need to borrow additional funds to make these payments or undertake alternative financing plans, such as refinancing or restructuring our debt, or reducing or delaying capital investments and acquisitions. Additional funds or alternative financing may not be available to us on favorable terms, or at all. Our inability to generate sufficient cash flow from operations or obtain additional funds or alternative financing on acceptable terms could have a material adverse effect on our business, prospects, financial condition and results of operations. Or what about the part about how they completely depend on the 4th quarter and the holiday sales? One out of four... I don't like those odds. All this should take you about 15 minutes to find when considering your investments (Hint: know what you're looking for and use the "find" function tool). Some may be willing to take the risk for the potential reward... what I to refer to as risk/reward (punishment) potential, but only you really know your risk tolerance level. At any rate, you should know the facts and use available information to distinguish investing from gambling. Going strictly on OSTK’s recent quarterly figures, the company’s burn rate (excluding capex) is approximately $3.4 mil. At this rate, its cash reserves and recent quarterly numbers imply that OSTK will run out of cash in about 9 months. Working cap burn rate gives a slight glimmer of hope for OSTK, suggesting that it has almost 15 months. What are they going to do about cash if they don’t drastically improve operating and net margins? I can understand that Pat Byrne uses his company to favor consumers, but this comes at the cost to its bottom line figures. He doesn’t want to “play the Wall St. game” and gives little importance to EBITDA. Growing top line is easy when you’re practically giving things away, but what does that mean for its shareholders? Pat Byrne seems like he’s reluctant to issue more shares to float. Its cost of cap is most likely to go up as banks would most likely second guess before lending to OSTK (who knows how it would be spent). I’m not sure funding his crusade would reflect a wise investment. Was all of this commotion a bad and costly publicity stunt to get people to visit overstock.com? Pat Byrne takes the insults and then passes the company off to his father, as he stated this plan in the recent Q&A with Motley Fool. Whatever the case, its business model makes little investment sense. They need to seriously improve operations. Its future simply remains too uncertain, especially with all of its hoopla going on now. As of today, the Fed Fund Futures is pricing that at least 25 basis point hike is pretty much definite. The September price also implies about 50% probabiliy that the Fed will move more aggressively and raise 50 basis points in their upcoming meeting on September 20th. You can refer to the resources mentioned at the end of my RWW article to see how fed fund futures probability works. Fed Fund Futures probability simply calculates what these futures prices imply and indicates what market participants expect from the Fed. This is just one of many tools to forecast the Fed's moves. Numbers can often be deceiving, and accounting shenanigans are something analysts must be aware of when researching companies. We must be thorough, especially when investments are at stake. Aside from financial figures, analysts look at other numbers to help diagnose companies. These numbers include survey data. Some people have expressed concerns about the review survey figures of Epinion, particularly that of Overstock.com. The number of reviews for Overstock.com on Epinion seem questionable. Amazon's 2004 annual revenue was $6.9 billion and received 1,060 Epinion reviews. Whereas, Overstock's trailing 12-month revenue adds to $641 million... yet it somehow managed to generate 35,286 Epinion reviews. Let me see if I'm getting this right. Overstock generates less than 1/10th the sales Amazon realizes, yet OSTK somehow managed to obtain 33 times the Epinion reviews than those for Amazon! Overstock must be really (and I mean REALLY) good at convincing their customers to take review surveys. Maybe it’s me, but I don’t remember being so enthused about taking customer surveys. To be fair, it is possible that Overstock is much more aggressive than Amazon when it comes to having its customers take reviews on Epinion. However, other reviews and surveys (particularly from Resellerrating.com) contradict that of Epinion. My point is this... only the survey takers really know how they rated a company. Survey numbers can be deceiving, so investors should be careful and not put too much faith in one survey. Overstock has been gaining alot of negative attention, and purely from an investment perspective, it's probably best to move on and consider better companies to add to the portfolio. If Oil Goes Any Higher... Something is Gonna Pop! I used to envy those who drove Hummers, Lincoln Navigators and the likes. Not anymore… like Mr. T used to say, “I pity the fool!” I pity the fools who drive those gas guzzling machines in highly gas priced environments. I remember when I could fill up my car for around 20 bucks; but now, I give a sigh of relief if I am able to fill it for under $40. That’s not nearly as bad as the poor fella that had to fork up 80 US dollars to feed his big badass Escalade. Ladies and Gentlemen, these ridiculous gas prices ARE a problem. I like to think that there is some glimmer of hope that we could avoid a dismal economic outlook… but if these gas prices continue, then that may be the negative catalyst that forces our US economy to come to a halt. If I have to consistently second guess or question whether I really need to take my car or not, then I’m thinking everyone is thinking something along the same line. There’s this term economists use, which is “purchasing power”… and well, I’m pretty sure I don’t have much of that given these conditions. Overstock.com has been gaining some headlines lately, so I figured I should take a quick look at its financials. Their recent quarter gross margin is 14% compared to Amazon's 23% annual gross margin. OSTK's admin costs are outpacing its gross profits... not good. It needs to seriously increase its gross profit per employee if it wants to generate any operating profits, and I don't know how they will do that with its CEO focused on his crusade to bring down the evil empire led by the Sith Lord. Onto its balance sheet... OSTK's inventory as a percentage of its total assets is approximately 26% compared to AMZN's 14%, which implies that OSTK is having a relatively tougher time getting rid of its inventory. OSTK has also been building up their PP&E, and such investments may be of some help to the company as its recent quarter gross margin has improved from a little over 10% in the same quarter in the previous year to its recent 14%. However, this figure isn't even close to that of AMZN, most likely due to company size and some product differences. There are really too many factors to consider, which I'm not going to get into in this 15 minute analysis. It has negative cash from operations, and its figures don't seem kosher... particularly the change in inventory. All in fairness, perhaps I've missed something; plus, this particular blog isn't a formal analysis. Beware of the free cash flow shown in Yahoo, because it is posting the recent quarter and general figures. It appears that the Yahoo figure is including sales and purchases of marketable shares (from the cash from investments). From what I understand, fixed capital investments should be factored in calculating free cash flow... not including marketable securities. With that said, OSTK sold over $100 million worth of marketable securities which would increase Yahoo's version of OSTK's free cash flow. I'm not certain exactly how Yahoo is calculating free cash flow, but I tend to notice they seem off at times... So I would recommend doing due dilligence before taking my word for it... especially from this blog analysis. It doesn't seem wildly overvalued at 1.38 price/sales. However, P/S shouldn't be the only valuation ratio in determining a company's value. I wouldn't recommend buying nor shorting (even if it was possible) OSTK. I will say that Byrne's recent actions can't be good for OSTK. With this said, I do not have any long or short positions of the companies mentioned in this blog. Traders, analysts, fund managers, and average day people all play the market. And tons of information and quantitative data flow continuously. Man, all this info gives me a headache. However, this concept known as chaos theory says there is order to this disorder. Do things really have a higher order of explaining these highly volatile fluctuations in various data? That's kinda like saying things are all predetermined... except it's too complex for a person to fully comprehend. Sure, people have utilized fractal patterns, fibonacci sequence, calculus, and everything math and life has to offer to better explain chaotic behavior... and I guess that's why we should be thankful for the mathmaticians and scientist that study and explain these things to the laymen like us. I'm the type of person that likes to understand concepts that's been thoroughly studied by some dedicated individuals and then apply the knowledge to however I see fit. Take for instance, people have analyzed music to where each note frequency can be seen as wave fluctuations like those in stock markets. They conclude certain frequencies allow scales to made simply because it sounds pleasing to the ear. I don't need to know every exact details to play what I am able to play. My question is who is playing the music, and can anyone hear what's being played? And what kinda music is being played by the markets? You have to love technology. You can actually teach your computer to make predictions. This process is known as Neural Network, which utilizes artificial intelligence to recognize patterns. Remember that it learns only what you teach it, so picking the right variables is extremely important in making correct predictions... garbage in, garbage out. I guess that's where the human touch is critical. Stats and math is a good tool to have around. And no matter what, we will never have a perfect model that explains everything... particularly the stock market. Einstein once said something like that you shouldn't put too much faith in a beautiful (mathematical) model, because there's alway room for error. That's funny because building models have become so easy with the development of statistical software packages. However, relying on what they spit out as results is like going on blind faith. For instance, say that you have built a nice model to predict the GDP. However, if the independant variable(s) you've chosen result in a regression error that is serially correlated, then you should know what that means and what those numbers say. It's probably true that nobody can beat the market if they solely rely on couple of factors. It is necessary that many tools be used to manage your money. I like to think of investing as going into battle... the more intelligent weapons (tools) you have, the better likelihood of your success. How High Will Oil Prices Go? I suppose this is the question on everyone's minds. I think the following link will give readers a good overview of how gas prices work. This should give a good starting point to understanding where oil prices may head. Are Markets Random or Not? I've read many text on how people think market prices move randomly. This means that past price movements have no predictive value... So does this mean most of the financial professionals have no value in doing their jobs? Indeed this is something that academics would like to believe, thinking a simple buy and hold strategy is the best method to profit from markets. They also believe that there is no benefit of utilizing fundamental and technical analysis. I'm sorry... I don't think markets are that simple. Their theories about how nobody can beat the market is ridiculous. People need to start thinking "outside the box" and realize that markets are not so random. Value can be found, especially when all the analytical tools are simultaneously applied. John W. Snow appeared on CNBC and finanlly admitted that Chinese authorities have engaged in the derivatives market to exploit hedging techniques. I wrote about this in my July newsletter for R.W. Wentworth. The more that people have attempted to explain Greenspan’s conundrum, the more confused everyone seems to be. Well, let’s break the situation down. We know that entities have been purchasing long-term Treasuries, pushing down the yields on these securities. Many believe the Chinese have contributed to this phenomenon. Here is a possible explanation to why entities have bought Treasuries. Before the Asian crisis came to fruition, Asian institutions have been engaged in the “carry-trade.” Many hedging institutions use carry-trade strategies to profit handsomely from discrepancies in interest rates between economies. To briefly explain this hedging method, one would borrows (short) from the economy with the relatively lower interest rate and lends (long) to that with the higher interest rate. Under some crucial assumptions, this strategy virtually allows one to make what I like to call free money. However, conventional wisdom tells us that there is no such thing as free lunch. For instance, a cross-border carry-trade method works only under a fixed exchange rate system with interest rate differentials, because exchange risk must be eliminated. Under a floating rate system, participants are vulnerable to foreign exchange risk. If China is abusing the carry-trade strategy, then that may explain their true reluctance to float the Yuan. China has been able to borrow on international capital markets at a lower rate than the World Bank charges. According to Nouriel Roubini, Associate Professor of Economics and International Business at Stern School of Business (NYU), credit in China is reported to be unusually low, both in nominal and real terms. Certain requirements may provide some light to China’s situation. Some participants use derivatives like swap contracts to set their positions and profit from carry-trade. Typically, the only capital involved in swap agreements is the posting of collateral, which is usually in the form of G-5 currencies or government securities (excluding Japanese government securities). Perhaps China has been using swap agreements and has bought U.S. Treasuries for collateral. As mentioned, this is only a possible explanation because this cannot be confirmed by public data. Entities that use derivatives keep their positions off-balance sheet, allowing users to elude accounting rules or government regulations.